The marquise diamond redefined regal grandeur and feminine appeal, and the diamond has been a stately choice for celebrities as well as royalty since its creation at the request of French royalty. One of Queen Mary’s most stunning brooches—which is still part of the British Crown Jewels—features a drop made from the Cullinan VI, an enormous 11.5 carat Marquise diamond, that is suspended from the diamond filigree enveloped Cullinan VIII (6.8 carat emerald diamond). This famous Marquise, still worn by Queen Elizabeth II, is a ‘chip’ from the massive Cullinan diamond that was cut into numerous stones for use by British royalty. Highly popular in the 1980s and early 90s, the marquise cut waned in public appeal but have exploded in popularity over the past few years, coinciding with the boom in popularity of vintage jewelry design. Their one-of-a-kind design and vintage, throw-back appeal are what makes them so desirable. The diamond’s elongated shape allows a marquise diamond setting to be horizontal, vertical or diagonal for a unique custom appearance. Fashion designer and former Spice Girl Victoria Beckham originally donned a large marquise diamond engagement ring from David Beckham. Ashlee Simpson’s vintage inspired engagement ring from Evan Ross features a marquise cut diamond surrounded by rubies and 140 smaller diamonds. Marquise diamonds are malleable to an individual’s personality and fashion style. Use the marquise to paint leaves for an ivy motif, petals on floral designs or set them in a solitaire for simple elegance. While the marquise can be set in a variety of styles, be mindful of the stone—especially the pointed tips—to preserve and protect the beauty of the diamond. 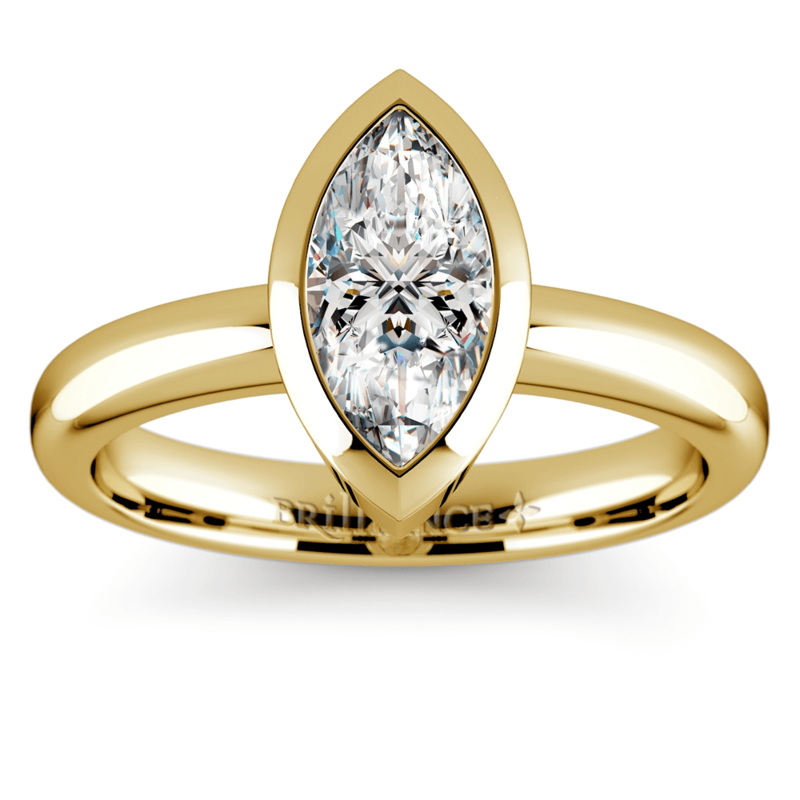 The marquise shape curves into two sharp points on the top and bottom of the stone. These tips are very prone to chipping and must be protected with the proper setting. Choose settings that offer a v-prong that completely covers and protects both tips for maximum protection. This may eliminate some ring style options—like tension settings. For protective elegance, choose a setting featuring four standard type prongs and two v-prongs to protect the tips of the Marquise. Platinum and white gold magnify the clean color of diamonds with whiter brighter color ratings, and yellow gold and rose gold camouflage a yellow undertone of a Marquise that might have a slightly lower color quality. Bezel solitaire settings offer a contemporary appeal that highlights the marquise’s unique shape and style. The bezel setting acts as a metal halo that completely surrounds and protects the sides (and tips) of the diamond. While bezel settings are often used for round brilliant diamonds, the setting magnificently morphs when used with a Marquise diamond. A horizontal marquise in a bezel epitomizes avant garde appeal. Solitaire settings show the glory of the Marquise, but pairing the shape with additional diamonds amplifies and displays the drama of the shape. Step-cut faceting is often found in antique diamond jewelry. Diamonds that display this cutting style— the baguette, Asscher and emerald cuts—provide cohesive vintage inspiration when paired alongside a marquise center. 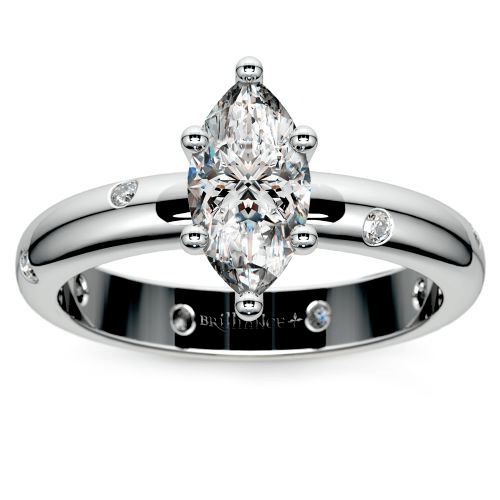 Two baguette side stones frame a marquise diamond center stone in this three-stone baguette diamond engagement ring. Play with metal types and side stone sizes in order to personalize the look even more. 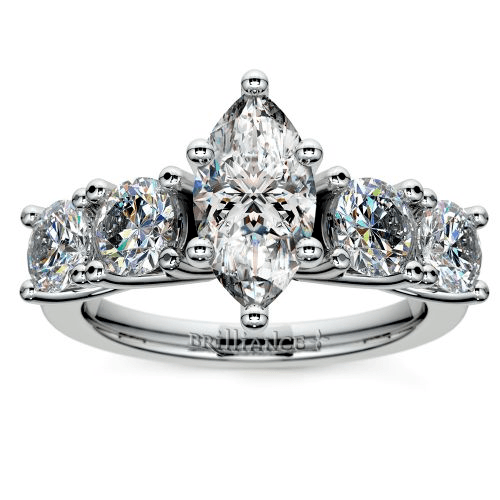 Round diamonds create a more modern ring design when paired with a center Marquise. The brilliance of round diamonds gives the marquise setting optimum sparkle. The Trellis Five Diamond Engagement ring celebrates sparkle with 0.75 carats of round brilliant side stones (two on each side). Choose a bold large carat centerpiece Marquise to leave a dramatic mark. Dainty diamonds also can be used for a sprinkle of pizzazz and to give just a touch of fire to the beautiful Marquise. Use tiny round diamonds to create starlight sparks or rainbow bubbles of iridescence. Tiny sparkling white round diamonds offer star-like twinkle to a simple white-gold or platinum band setting. 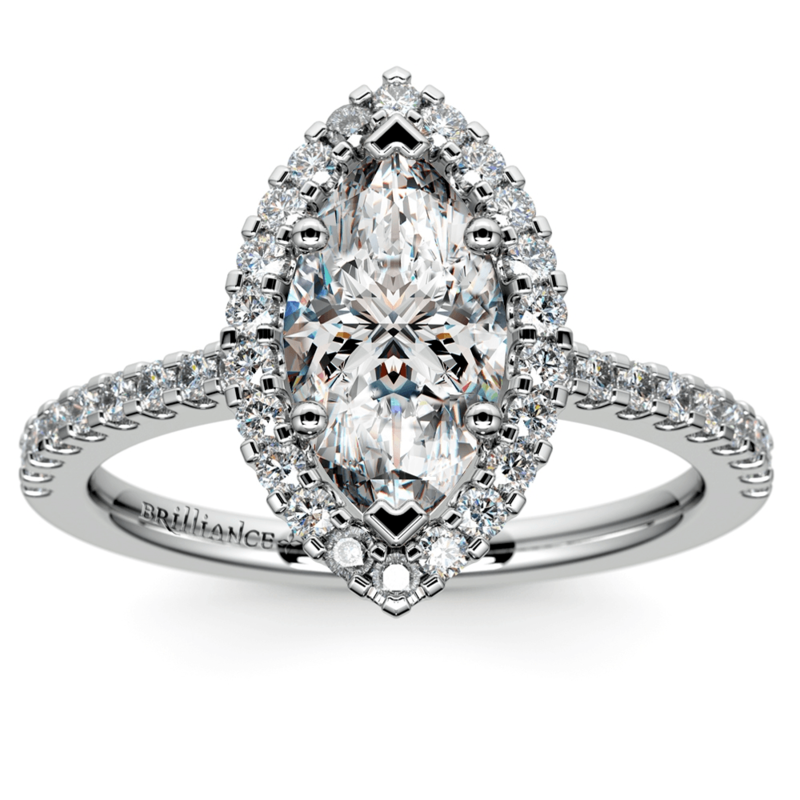 The Inset Diamond Engagement ring features one-sixth carat of diamonds sprinkled around a center set marquise. Choose white metals to add a mirror-like appearance for the starry accents. 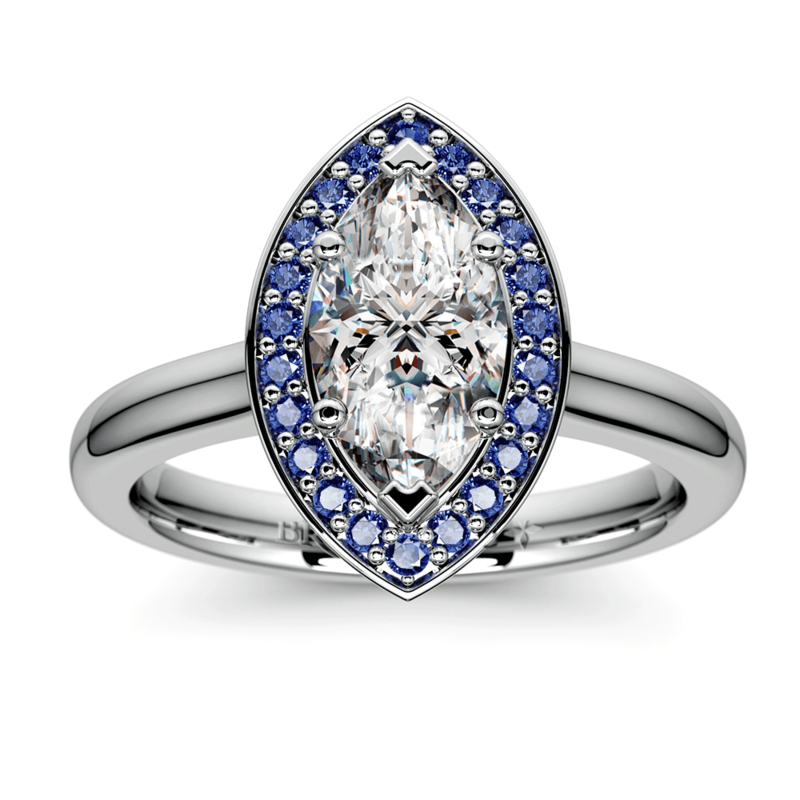 Step back in time with the Art Deco style of the Roaring 20s by surrounding the marquise with a diamond halo. White diamonds provide a classic, clean look for the regal marquise. 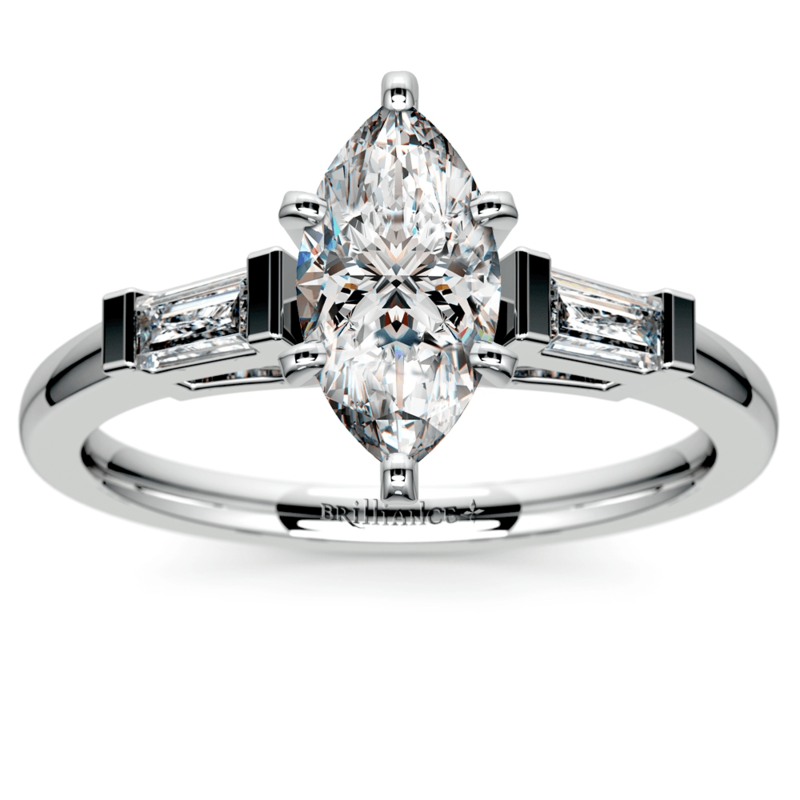 The Halo Diamond Engagement Ring has the perfect diamond halo frame for a marquise diamond setting. More diamonds decorate the band for seamless sparkle. 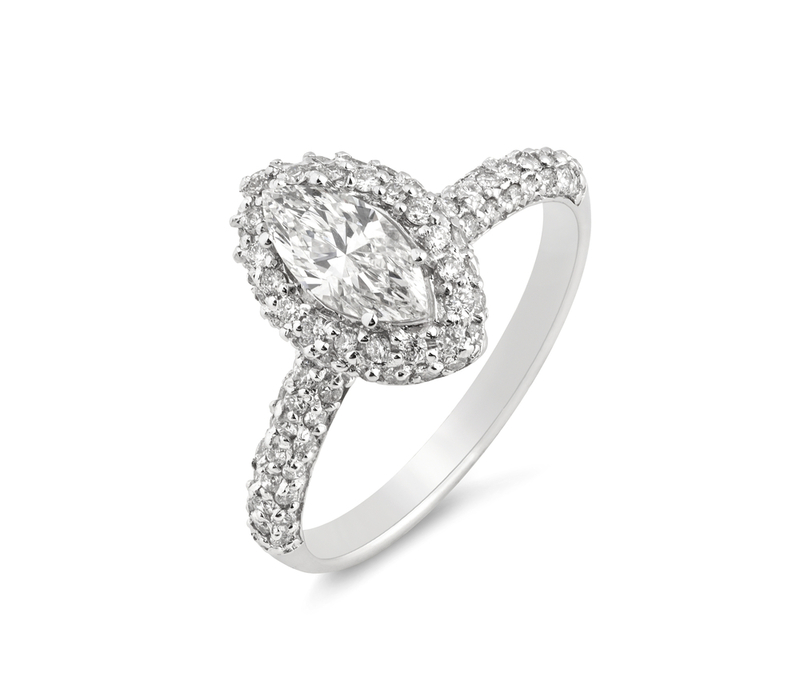 To channel the Art Deco appeal, choose white gold or platinum. Opt for rose gold for a blushing innocence that nods to Victorian era rings. 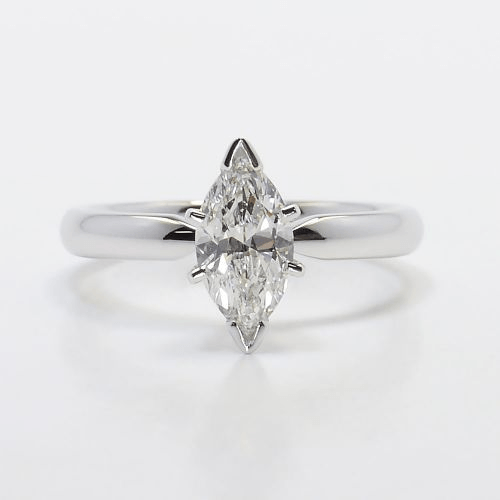 Individuality and a regal grace sets the marquise shape apart from more common diamond cuts like the round brilliant, the princess or the cushion. A a contemporary bezel cut or platinum setting will showcase the marquise diamond’s unique shape, while an additional touch of color or step-cut side stones will highlight its vintage appeal. Whatever setting you choose, it’s important that it protects your delicate marquise diamond, and that you maintain your marquise ring to ensure it stays beautiful brilliant for years to come.